This is a slot machine where Novomatic does what Novomatic does best. There are five reels in Amazing Fruits, all filled with deliciously ripe produce! The clue is in the name, the fruit symbols really do look like amazing fruit! You would definitely pick up these juicy fruits in the store. They’re colourful and look good enough to eat. This has the feel of one of Novomatic’s early fruit slots but it’s just been given a face lift! All of the familiar features are there! You can play the game in autoplay mode and you can stake your wins using the gamble game! 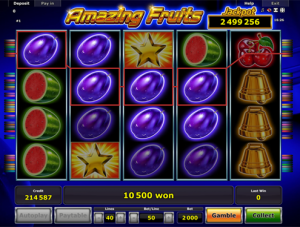 There are five reels and forty paylines in total in Amazing Fruits. The slot has quite a low RTP for a Novomatic slot but it’s more than made up for with the jackpot! Amazing Fruits doesn’t have a millionaire jackpot like some other games do, but it’s still pretty sizeable and attainable! The jackpot is a progressive jackpot, which means that it will get bigger the more you play! You can win the Jackpot during the Free Games in Amazing Fruits. There’s no Wild symbol in this game but there is a Scatter symbol. Novomatic made so many similar games to this one! Fruitilicious, Fruits n Sevens, Ultra Hot Deluxe and Simply Wild are just a few examples. Anyone who has a fondness for their fruity slots will enjoy Amazing Fruits. Once you’ve tried it out for fun, head on over to sign up at any one of our recommended Novomatic Casinos to play for real! Although the name might suggest otherwise, Amazing Fruits doesn’t only have fruit symbols on its reels! There are also some very familiar slot symbols on these bright and colourful reels, such as the red seven, the golden bell and the golden star. The symbols are all high-definition and if the fruit were in your fruit bowl, you’d want to eat it all up! The fruit symbols include: cherries, lemons, oranges, plums and watermelons. The fruit symbols, except the watermelon, pay out the same amount of money. The watermelon pays more, like the golden bell, but not too much. The red seven, on the other hand, gives out huge wins! Three or more consecutive matches are needed for a payout. Aside from the cherries, which only need two consecutive matches. Even if the matches are consecutive, if they don’t fall on an active payline, they won’t pay out! Amazing Fruits has 40 paylines. They’re all automatically active but you can deactivate as many as you want. Then you can use the settings (all found underneath the reels) to adjust the bet per line. The more you bet, the bigger the payouts will be! The paylines only pay from left to right so keep an eye on the leftmost reels for the matching symbols! As we’ve already mentioned, Amazing Fruits has a big, progressive jackpot! You can win this jackpot during the Free Games. That’s right: you can win Free Games in this slot game! In fact, you can win 10 at a time! All you have to do to win 10 Free Games is to spin three golden star symbols. The golden star symbols are Scatter symbols so they pay in any position. Unlike the other symbols, you don’t have to spin the star symbols consecutively or on paylines to get a win or to get Free Games! Three or more of these landing anywhere on the reels during a single spin will give you 10 Free Games. The wins that you can get during the Free Games aren’t like the wins in the normal game and the aim is not to match up as many symbols as possible. Instead, what you’ll have to do is spin as many golden stars as possible! The three golden star symbols that originally triggered the Free Games will stay in place and any other golden star symbols that fall during the Free Games will also stick in place. At the end of the 10 spins, the win you get will be based on how many golden stars you have! Obviously, the more golden star symbols you spin during the Free Games, means a bigger payout! You’ll need to spin 20 of them (so fill the whole screen with them) to get the progressive jackpot!